The Beatles 50 Years Ago Today: March 21, 1969. Beatles Radio: The Beatles, Solos, Covers, Birthdays, News The Fab 4 and More! 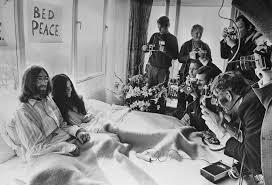 On March 21, 1969, Beatles singer, songwriter and guitarist John Lennon and his wife of a week Yoko Ono received the press at their bedside in the Presidential Suite of the Hilton Hotel, Amsterdam. The couple stayed in bed for seven days ‘as a protest against war and violence in the world’.